Our Playlists are now collaborative! Everybody loves playlists! Here at Blinkfire we use them daily for several internal tasks and we know our customers also use them to share post collections within their social media and sponsorship teams. They are a simple way to group social content, get inspired and share posts. However, they were missing one obvious thing: they weren’t collaborative. A playlist belonged to just one user. Yeah, they were easy to share and you could always create a copy, but two users couldn’t work on the same playlist. Well, no more! From now on, if you need to have several people working on a unique playlist, you can mark your playlists as “Collaborative”. This means that any user that follows the playlist can add and remove posts from it. 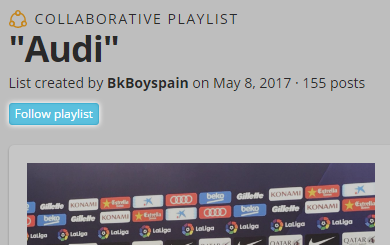 To mark a playlist as “Collaborative”, just go to My content > Playlists and hover your mouse pointer over the three dots icon. 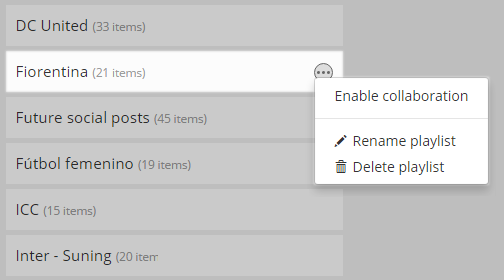 A new menu will appear that will let you rename or delete your playlist, plus enable collaboration on it. Once a playlist is marked as collaborative you will see an orange icon beside its name. If you want to disable collaboration you can do so by accessing the same menu. You can also just follow playlists you like, so you never lose track of them. To follow a playlist, just enter the playlist and click the blue “Follow playlist” button. You can unfollow any playlist whenever you want. All followed playlists will now appear on a separate list on My content > Playlists. We hope you really enjoy these new improvements. If you think of any other way to make playlists more useful, we’re all ears!